In today’s fast-paced world of getting orders into the hands of consumers and businesses seemingly instantaneously, warehouse managers have put a premium on the picking process. No picking technology can handle everything, whether its picking full pallets, partial cases or individual pieces, so it’s important to let the profiles of SKUs and orders lead you to the right solution. Many modern warehouses use a mix of different solutions for picking orders dictated by product type, product velocity and order type. To make the best selection of picking solutions, a thorough understanding of your customer service requirements blended with SKU profiles can help you pick the best system for the job. Not every warehouse needs automated picking solutions, which may save on labor, but the added cost and maintenance can be prohibitive. Once this information is gathered, many UNEX customers use our powerful warehouse slotting tool, SKUBE that analyzes the product data and movement, then suggests SKU locations. It determines what should go where to maximize efficiency and ensures products move easier and faster in the order picking process. Proper warehouse slotting can solve the problem of SKU proliferation, which occurs quite often in the food and beverage space, among others. As distributors handle more and more products – from craft beer to international foods – running out of space in the warehouse can be an issue. 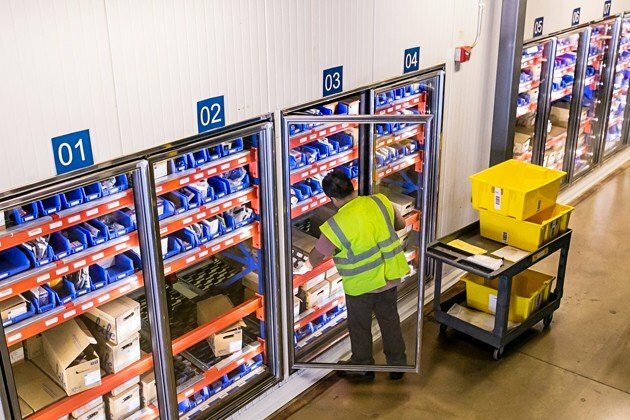 SKUBE assigns each product to pallets, carton flow or shelving units based on its analysis of movement so that items are stored in the right location for the fastest pick. Warehouse slotting is a complex exercise that takes skill, knowledge and the right tool to drive warehouse efficiencies, save space and speed order picking. It is not a game of chance. UNEX’s order picking solutions for piece, case, and/or pallet picking can speed order picking operations for most distributors – and without the maintenance responsibilities of automated systems. UNEX Pickologists work closely with clients to profile their SKUS to help them select the right picking solution for their operation. Then deploy the picking solution to improve productivity and increase accuracy – making your picking operations efficient and productive.